Traditional server clustering has always been one of the main 'bottlenecks' and complaints for most IT project roll-outs. The most common excuses from server admins: too complex, too expensive, taking too much power, rack space, air-con and the list goes on. To address these issues, there is a new breed of servers - not 1U or 2U rack mountable server and monstrous server blade - it's "Cluster-in-a-Box" or CiB in short. Adding up all components would take up about 8U of rack spaces with 7 different boxes or about 400% in saving in rack spaces against a single 2U Nutanix box. Look like we are entering the next wave of data center revolution. Does DELL MD32xx support hardware VSS snapshot for DPM Backup? Answer: Yes, but it's not official. It's best effort (due to its low cost as compared to its high cost Compellent counterpart). Hardware VSS snapshot provides an efficient way for DPM to backup Cluster Shared Volumes (CSVs) on Hyper-V cluster. Without hardware assisted snapshot, the CSV access would be placed under Redirect I/O mode as long as the backup process is taking place (which can be a long process). This can significantly reduce the I/O performance for other VMs on the same LUN. 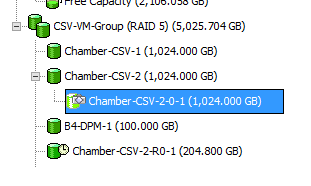 That's why it's more efficient to keep as small number of VMs per CSV as possible for software VSS. With hardware assisted VSS, a temporary snapshot is instead created on the free space on the SAN volume. CSV would only be placed on Redirect mode for a couple of minutes. How do we configure VSS setting on Dell MD storage? Step 1: Install the VSS provider given on the Dell MD Storage Manager DVD or ISO image. (C) Copyright 2001-2012 Microsoft Corp. Step 3: Configure the default VSS behavior on the storage as shown below. Run "C:\Program Files (x86)\Dell\SMprovider\provider\SmRegTool.exe" on the console installed with Dell Storage Manager. Connect to the storage using OOB Management IP addresses.